Priestess Christy Michaels, M.A. 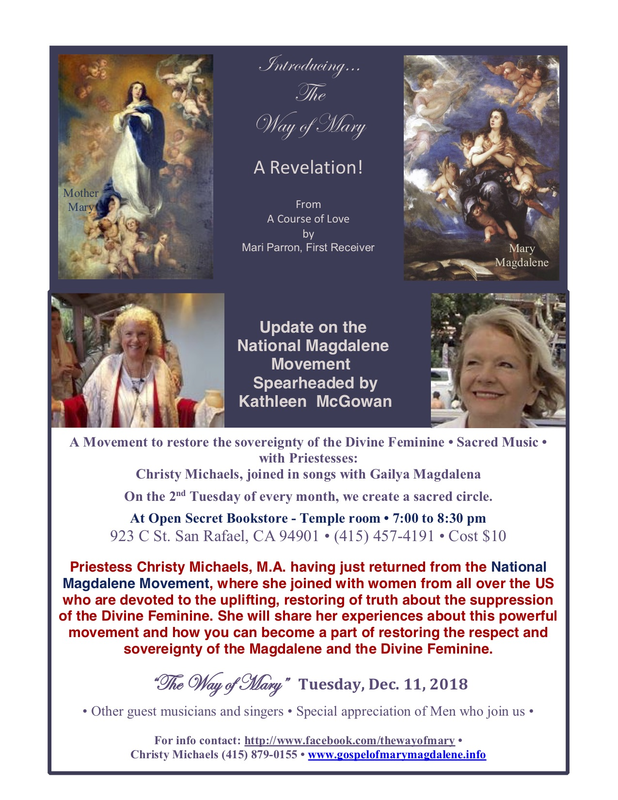 having just returned from the National Magdalene Movement, where she joined with women from all over the US who are devoted to the uplifting, restoring of truth about the suppression of the Divine Feminine will share her experiences about this powerful movement and how you can become a part of restoring the respect and sovereignty of the Magdalene and the Divine Feminine. 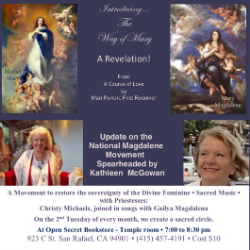 "The Magdalene Movement A Celebration of Sisterhood Expressing and Activating the Divine Feminine..."
From this moment on she experienced a profound shift in her energy that launched her into her work as a Priestess devoted to Mary Magdalene. She began receiving visions for sacred rituals. At Easter, she leads an evening moonrise service that tells the story of Easter from Magdalene's point of view, with hundreds of people walking a 6-station ritual, following in her footsteps. Her monthly events on the Gospel of Mary take on a Jungian exploration into the mysteries of Her Gospel, which tells us the story of the good news that there is no death and we are sinless. 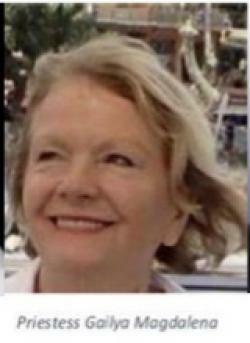 She also began her study of Compassionate Communication/NVC in 1989 with Dr. Marshall Rosenberg and has attended numerous trainings with several of the NVC facilitators, including training with Robert Gonzales, President of the Board of Directors for the Center for Nonviolent Communication. 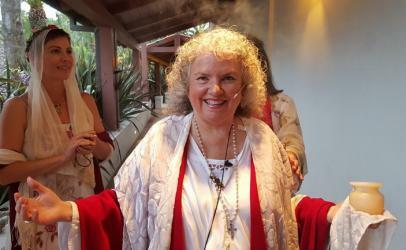 She has co-lead many Compassionate Communication Practice Groups.